The Apple corporation engineers have provided a signal system in order to inform the user about possible faults and errors, which can occur to their Cinema Displays. Apple Cinema Displays use their power LED (lower right corner) to inform a user about faults and errors. If any of them occurs, the LED will blink in a certain Morse-code style pattern. The Apple Cinema Display is a line of flat panel computer monitors, developed and marketed by Apple, Inc. The first Apple Cinema Display was released in September of 1999. Both the early display, as well as its newer models, were available in several different sizes. 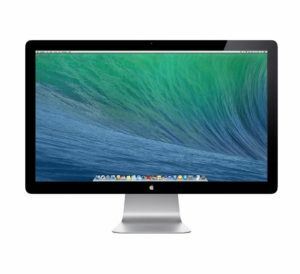 The Apple Thunderbolt Display was introduced in July 2011. This 27-inch flat panel monitor is the only display currently marketed by Apple, Inc.
short, short, short – The display is detecting either a wrong video format, or an unsupported resolution. Verify that your equipment is compatible, and then restart the computer. If the issue continues, reset the PRAM. If you have reset the PRAM and are still getting the error, shut down the computer, power cycle the Cinema Display, then turn the computer back on. short, long, short – Make sure you are using the correct power adapter with the display. This alert will only appear on displays built in 2004 or later, which require an external power adapter. short, short, long – The display is detecting a backlight error. Check your display’s power connections and restart the computer. If the problem continues, contact Apple or an Apple Authorized Service Provider. In September 1999, Apple introduced a line of flat panel computer monitors, called the Apple Cinema Display. The monitor was initially sold alongside the older line of Studio Displays; however, the new line eventually replaced them. 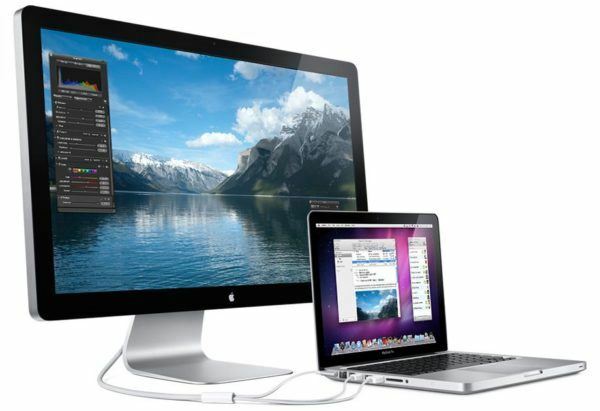 In July 2011, Apple introduced its successor, the Thunderbolt Display. Since that moment on, the Cinema Display was considered outdated by consumers. It was even removed from the Apple Store website in August of 2014. Apple offered 20-, 22-, 23-, 24-, 27- and 30-inch sizes, with the last model being a 27-inch size with LED backlighting. There have been three designs for the Cinema Display; one featured polycarbonate plastic, while the other two featured anodized aluminum. The first monitors were designed to match the colorful plastic of both the Power Mac G3 and G4. The second revisions were designed to match the more professional aesthetics of both the Power Mac G5 and PowerBook G4. The last available design matched the uni-body laptops, which were released in October of 2008. (The Thunderbolt Display uses the same design as the 27-inch size Cinema LED Display). The first model, the 22-inch Apple Cinema Display, was introduced in September 1999, alongside the Power Mac G4 and used DVI for video input. It was enclosed in a high-density plastic frame with an easel-style stand, and had a display resolution of 1600×1024. This model was upgraded in July 2000, with the Apple Display Connector (ADC). It ran both DVI and USB, as well as 25V of power through a single connector. It was eventually replaced by the 20-inch model on January 28, 2003, which sported a widescreen display with1680×1050 resolution. The 23-inch model, dubbed the “Cinema HD Display,” was introduced on March 20, 2002, and supported full 1080p resolution. On June 28, 2004, Apple introduced a redesigned line of Cinema Displays, along with a new 30-inch model. Much like the 23-inch model, the 30-inch also carried the “Cinema HD Display” name. The new models had an anodized aluminum enclosure which matched all of Apple’s high-end products. Either an alternative stand or a wall mount could be used with a VESA mount adapter kit (which was sold separately). Though the display enclosures had not been redesigned for a long period of time, several “silent” improvements were made to the brightness levels and contrast ratios. With the introduction of the 24-inch LED Cinema Display in October 2008, the 23-inch Cinema HD Display was discontinued. The 20-inch model was also discontinued in February 2009, leaving the 30-inch display as the only model available for sale. Due to the high resolution (2560×1600), the 30-inch model requires a graphics card that supports dual-link DVI. Currently, no Macintosh is sold with a dual-link DVI port. All Power Mac G5, PowerBook G4 and Mac Pro models since the release of the said display are capable of supporting the resolution without the use of any adapters. The Discrete MacBook Pros are also capable of driving the 30-inch display, while all Macs released after October 2008 require an additional adapter. The 30-inch Cinema Display was introduced along with the GeForce 6800, both of which support the two DVI-DL ports. ATI’s aftermarket AGP X800 Mac Edition also supports dual-link DVI, but has only one port available. The Radeon 9600 Mac/PC was another aftermarket graphics card that supported the dual-link DVI and conveniently, was also compatible with older AGP-based Power Macs. If a computer with a single-link DVI port (such as a Mac laptop with a mini-DVI connector) is connected to the 30-inch display, it will only run at 1280×800, even if the computer is capable of supporting 1920×1200 over a single-link connection. The aluminum and glass models were launched on October 14th, 2008, but Apple has since removed the matte and anti-glare screen panels in all of its Cinema Display lineup, except for the 30-inch model. Apple moved away from matte screens in its line of iMac desktop computers on August 7, 2007 and no longer offers any equipment with a matte, anti-glare screen after the 15″ non-Retina MacBook Pro was discontinued in October 2013. This has caused concern among users who want matte screens for their particular area of work, particularly graphic designers, photographers, and users who extensively view their screens. To save money for a newer model, sell your old Apple Cinema Display to iGotOffer for the best price online. We buy your used Apple Displays. Free instant quote, free fully insured shipping, fast and secure payment: Used Apple Display for sell. Published on October 8, 2012 by the TechnologyLasts. More error codes can be found ii you dig deep enough, but these are more than enough for an average customer, agree. Besides Apple Cinema Display is becoming really obsolete with all the new devices coming.